This tropical plant is intolerant of frost. In the U.S., it is popularly grown as a houseplant, achieving its best indoor container growth at room temperatures ranging from 65 to 85 degrees F. Avoid temperatures that dip below 60 degrees F. because the cooler air may damage plant foliage. Containers are best placed in bright indirect light. Avoid direct sun. Use a peaty potting mix. Apply fertilizer monthly and keep soil consistently moist during the growing season, but reduce fertilizing and watering over winter. Pinch stems to shape as needed. New plants are easily propagated from 4-inch stem cuttings taken in spring or early summer. Where winter hardy outdoors, this plant is best grown in fertile, moist but well-drained soils in part shade. Scindapsus pictus, commonly known as satin pothos or silk pothos, is a slow-growing tropical evergreen climber in the Arum family. It is native to Southeast Asia. In its native habitat, it climbs tree trunks by aerial rootlets or if unsupported tumbles along the ground. Outdoor plants typically grow to 3-6’ (less frequently to 10’) tall if grown through a tree, over a pergola or against a wall. In the U.S., this plant is typically grown indoors as an ornamental plant for appreciation of its alternate, attractively-patterned leaves. Satin pothos leaves come in two different forms: juvenile leaves are oval and entire, but mature leaves are pinnately lobed. Sometimes leaves on a mature plant will have both entire and pinnate leaves. This plant is typically cultivated in its juvenile phase which features ovate, entire leaves (3-4” long) with heart-shaped bases. 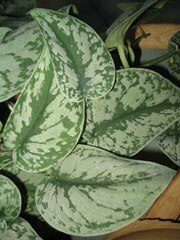 Each leaf is satin-textured and matte green to deep green above decorated with irregular silver-gray blotches, but paler and unblotched beneath. Indoor plants typically grow to 18-36” tall if trained on a support such as a moss stick, but may grow taller in commercial plantings or greenhouses. Plants may also be trailed from hanging baskets. Spikes of tiny insignificant apetalous flowers enclosed in spathes bloom in summer. Flowers are followed by small berries. Flowers and berries rarely appear on indoor plants. Epipremnum pictum is a synonym of the species. Specific epithet from Latin means painted or brightly colored in reference to leaf variegation. ‘Argyraeus’ leaves have silver-white edges. Argyraeus means silvery. No serious insect or disease problems. Watch for fungal leaf spot and botrytis. Roots may rot in poorly drained soils. Scale and mites may appear. Good houseplant for sunny to shady areas. Grow in containers on upright stakes (moss stick) or trail downward from pots or hanging baskets.